What happens to your video after you’ve uploaded one to YouTube? YouTube serves video playback quality to best suit your viewing-screen! I usually make videos using the Xvid codec using an “economical” compression setting that balances file size with desired image quality. These usually weigh in at around 80mb dependent on length and visual complexity. The example I’ll be using will be a heavy-weight AVI by my standards and originally when rendered it weighs in at the 138mb mark. 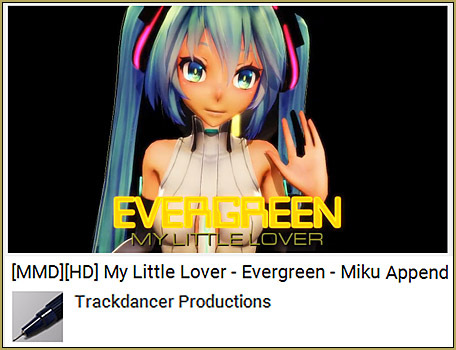 It was rendered at 30 fps at 1280×720 pixels – this qualifies as “HD” on YouTube’s server. The original was embedded with a WAV audio file that accounts for 59.4mb of the total (so the visual component actually weighs in at about 138.304-59.4=78.904mb). Now when you play a video on YouTube and right click on it, it will open up a submenu and one of the selections is “Stats for Nerds” and some of this information is actually quite useful, or at least interesting, and what I’ll do here is to explain what these stats mean. It is important to note that my PC was connected to the Internet via a good WiFi connection whilst writing this; in Starbucks, if you must know, as, in addition to the excellent coffee, their Internet connection is actually pretty solid. CLICK to see full-size image! Mime Type: The type of media – specifically it’s a mpeg standard video – remember that the original was an AVI. And the codec YouTube used to compress the video. Connection Speed: self-explanatory – but at 1940kbps over a wireless connection, this is very good. Dropped Frames: data that is lost in the transfer procedure – the higher this number the more choppy your video will be. Since my connection only dropped 3 frames out of 1404 served my connection is pretty solid. DASH is interesting because basically what YouTube is doing is using http protocol to stream videos which has some technical advantages and you can actually see this in action. The easiest way to do this is to go full screen whilst a video is playing. 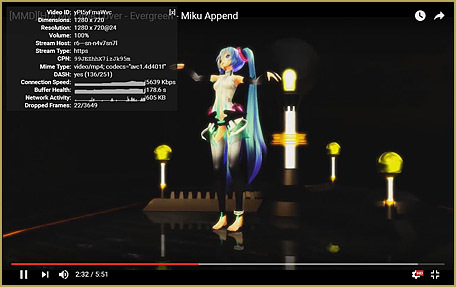 At first the image will be a little bit blurred because the player is still using the data that was already sent into the buffer. Then (if your connection is good) the image will visibly sharpen as the video continues to play. This is because the YouTube service can detect what size you’re playing the video at and will send the best possible format with the following packages. It can do this because it uses http packages: each package sent at a quality optimized for best play back. Just to be clear, your PC and the YouTube server are actually communicating with each other whilst the video is playing. 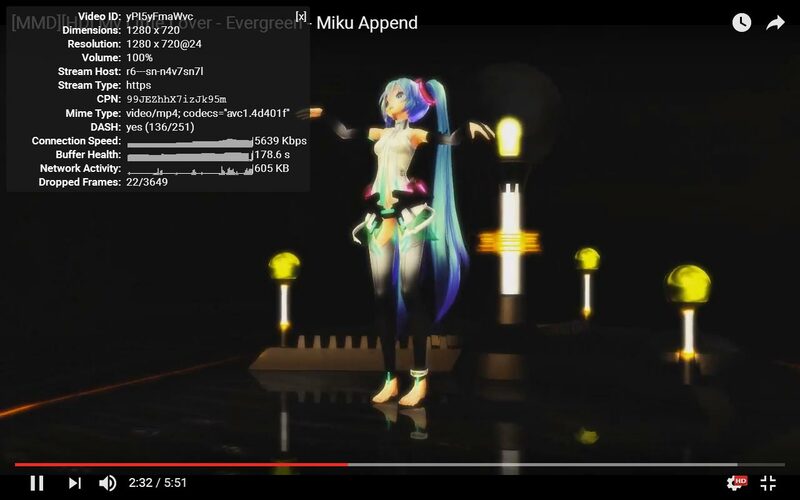 In case it is not obvious, let it be clear that the YouTube server (at the very least) knows your IP address, the type and quality of connection you have, what type of device the video is playing on, what resolution the video is playing at. This also means they know where you are… and if you’re logged in, who you are. Dimensions: The video is playing at the maximum size available for the video on my monitor: 1280×720. My screen is 1280×800. Resolution: This is the at 1280×720 – the size I made my original video at, and it’s playing back at 24 fps. Now if I made my video at say 640×320 and played it full screen, well it’ll look really bad. This is why I advise that you always render your videos to the maximum size available on your screen. Notice how these two have increased! Why? Because I’m now playing full screen which means more data so the YouTube server really started pumping out the data so that I have the best possible viewing experience. The network activity figure also gives a clue as to how hard the two computers (YouTube’s server and my laptop) are working to keep the video playing seamlessly. Dropped Frames: 22/3649 – losing only 22 frames out of 3649 served – no complaints there. Well, hope you find some of this helpful. This information can be useful for those of you wishing to get the best out of the YouTube service. You’ll now know how to best optimize your videos for their server. When you go from the normal player size to full screen, the YT server also switches files served. Crudely: if you’re playing in the normal window, the YT server just sends the 640×320 version of your video but when you go full screen it’ll switch to their version of the full screen render that (hopefully) you originally uploaded. This is why I keep harping on rendering your videos at full screen sizes if possible. Render before you go to sleep – it’ll be done when you wake up in the morning. Upload whilst you go to work, school or on the following night. But honestly, my videos usually upload in less than 15 mins because I do it during off peak hours when their service isn’t swamped and the network activity over the Internet in the area where I live is low.